Then of course there is the most universal: don't worry, I'll Google it. Have you ever wondered whether you can conjugate Google? According to the Oxford English Dictionary, the answer is yes. Google is the real deal - a recognised verb. And I have heard my mum talk about Googling. So that seals it. But enough of conjugation - I have chanced* upon something far more exciting. Did you know that the Google search engine has its own secret language? Special stuff you can add to refine your searches - its magic. * I mean "chanced" in the sense of following a comment left on my blog by someone called Generic Viagra. Its a long story. And possibly not easily explained. So I think I should stop now. ... you will receive definitions for "stitch in the ditch" sourced from various websites. Each version is referenced back to the original source. 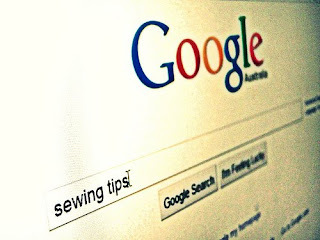 ... the search will return a list of websites related to sewing patterns. Combine info: with a webpage address and Google will return some background information about the page. The information is usually about 23 words. ... the search will return an excellent list of PDF documents that mention pressing hams. ... the results will show only pages that have the words pattern and alterations in the title. None of the page text will be searched. Allintitle cannot be combined with other search criteria. .... the results will show all pages that have the word pattern in the page title and the word alterations somewhere in the text of the webpages. ... the results will only contain websites with both the words dress and pattern in the URL. ... the results will contain websites with the word dress in the URL and the word pattern somewhere in the text of the page. Oh. so much stuff I really didn't have the faintest idea about. Well, actually - I knew about it, enough to know I knew nothing about it. This is like Cliff's notes to Google. Thanks so much. this is fabulous ~ incredibly useful! thanks for sharing Liesl. This is fabulous information. Thank you!! I really don't think your blog would come up as 'garbage'. Don't know where you find all your info, or all the time to find your info, but since I'm having a day off I'm off to play Google. This is fantastic! Thanks so much. I had no idea about any of this. Ok now how does one nearly half a century old person remember all this? I might copy it, paste it and/or print it ! YOu are the Google master!! A font of useful tips. I'll be bookmarking this post! Really useful Liesl! Heaps of great information, thanks! Excellent info Liesl. Even my 7 year old said the other day "I'll just google it mum" I mean what ever happened to looking it up in the World Book Encyclopedia! Wow you leave the '... for dummies' books for dead - er I don't mean you're a dummy. This post is a definite for bookmarking...I wonder if in the future we'll 'hoppobumpo' it? Thanks for the Google master class! I'm off to have a play NOW! Ah, very cool. I knew about a few of those - but not all. And now I do, thanks!! this info is SO GOOD! Thanks Liesl! P.S. It was almost a year ago you wrote a post about your dry hands... hope this os not happening again. WATER lovely and lots of it! That is awesome. What great tips, thank you! I knew there was a more effective way to use google but I had no idea where to start (other than googling it hehehe).Thanks for sharing! I'll be bookmarking this post for future reference. You're a helper Ms HB. You forgot to add a link for Let Me Google That For You http://lmgtfy.com/, which is my very favourite. Anyway, I think you are the googliest!